Exploring locales such as city streets, bus stops, parking lots, bars, retail establishments, and discussion groups, Together Alone ventures into what is often thought of as the realm of passing strangers to examine the nature of personal relationships conducted in public spaces. While most studies of social interaction have gone behind closed doors to focus on relationships in the family, school, and workplace, this innovative collection pushes the boundaries of the field by analyzing both fleeting and anchored relationships in the seldom-studied communal areas where much of contemporary life takes place. 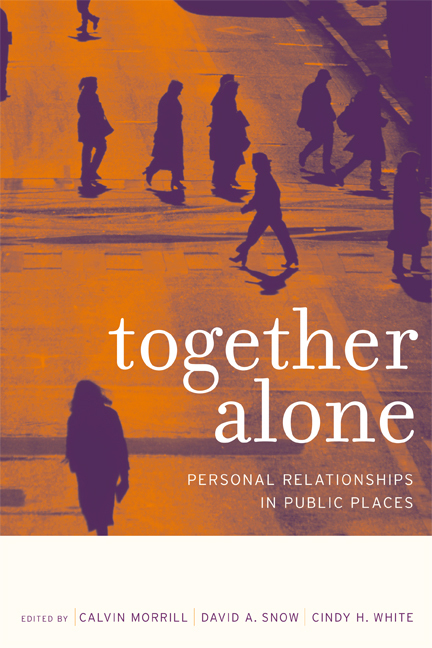 The contributors shed light on the diversity and character of day-to-day negotiations in public spaces and at the same time illuminate how these social ties paradoxically blend aspects of durability and brevity, of emotional closeness and distance, of being together and alone. Calvin Morrill is Professor and Chair of Sociology at the University of California, Irvine. He is the author of The Executive Way: Conflict Management in Corporations (1995). David A. Snow is Professor of Sociology at the University of California, Irvine. He is the coauthor of The Blackwell Companion to Social Movements (2003) and Down on Their Luck: A Study of Homeless Street People (California, 1993). Cindy H. White is Associate Professor of Communication at the University of Colorado, Boulder.